The Institute for Public Administration, Politics and Public Policy seeks to add understanding and value to local, regional, state and international communities through relevant programs and research that provides analysis, recommendation and public service education. The Institute’s conduct is grounded in two foundational values of St. Mary’s University – service and community building for the common good. The Institute provides a forum for the discussion and elucidation of local, regional and state public issues through Community Conversations and other public forums. The Institute also generates research, reports and other appropriate analyses for public agencies, non-governmental entities and general community use that address public interest topics and issues. These research undertakings draw upon the entire intellectual assets and disciplines that constitute the St. Mary’s scholarly community. The Institute provides opportunities for intellectual and professional development through work on research projects and participation in public fora, surveys, polling, seminars and workshops. It looks to include the participation of both university students and faculty in the various activities and programs sponsored through or initiated by the Institute. Research at all academic and intellectual levels involves mentorship opportunities for faculty with students. One of the primary goals of the Institute is to develop outreach programs that foster dialogue between the University, the public, government agencies and nonprofits to address important public issues. Recent topics have included environmental issues and policy, challenges and opportunities for women in business and labor, and personal conversations with community leaders. For more information on Community Conversations, email the Institute or visit the University Events for upcoming dates. These programs are intended to foster dialogue between the university, professional, public sector and non-governmental agencies. These may include workshops, seminars or sponsoring visits with various agencies, governmental and non-governmental. This effort is intended to assist faculty in identifying and obtaining external funding for research including polling or survey research as well as policy analysis in the local, regional, and international areas (e.g., Latin America, Asia or Africa). The policy analysis will be oriented toward providing much needed public service research for local governments who lack resources to undertake such efforts. The Institute will undertake research relevant to local, regional, state and international issues and challenges. Drawing on the expertise of interdisciplinary teams, Institute research findings will aid the understanding and decision-making of civic, business, non-profit and citizen groups locally and beyond. This is a schedule of regular colloquia, speakers and for a for the St. Mary’s and local communities relating to the three focus areas of Public Administration, Politics and Public Policy. 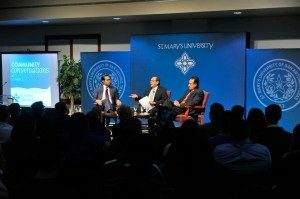 This program has already been initiated as Community Conversations Series at St. Mary’s University. These community events address local, regional, state and international issues of importance to San Antonio, Bexar County and beyond. The Institute will publish, at least annually, proceedings from the colloquia and speakers’ series. The Institute will also publish the research efforts of the faculty who undertake research through the development opportunities. Certificate programs will be developed in various areas after consultation with the advisory board and university administration. Certificate programs have the potential of adding an additional funding source to university programs.